Yep, I’m back. Deal with it. To be clear: I do not invest in stocks at all, and have not incurred financial losses over Apple’s stock. However, I always thought that if I was going to invest in anything, it would be in Apple. The truth is, the foundations and operational successes of the company, by all critical measures, should result in an incredibly healthy stock price. Unfortunately, stock prices are determined more by speculators and those within the trading world that would benefit directly from the prices hitting certain points. Thus, they are controlled by forces we cannot truly understand as outsiders. False. Since Jobs’ passing, Apple’s shares have soared more than 80% percent. False. While he may not have Jobs’ stage presence, Cook has innovated his way to quite possibly the most efficient distribution network possible for his products. As noted in Information Week, he is considered a master of logistics, and is credited with “re-engineering Apple’s supply chain to increase profit margins while allowing for more flexibility to produce new products and make changes on the fly”. This is new territory that Jobs was never able to conquer. False. Unless the next thing you say is “I have noticed that I tend to speak nonsense, so I will cease speaking”, please stop talking. This is a critical point, so pay attention. 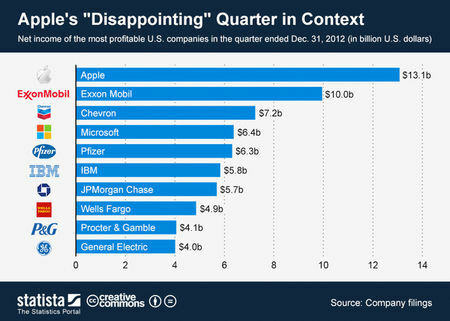 Apple is not just a profitable company; it is the most profitable company in the United States. In their most recent quarterly report, Apple posted a record-breaking fifty four and a half billion dollars in profits. They generated more revenue in one quarter than Google did in all of 2012. Coincidentally, that is about fifty four and a half billion dollars more profit than Amazon makes (hint: they kind of don’t make money). Then be silent and humbled, and think about it again. Then go do some humble yoga, eat some humble pie, and practice your impression of an inanimate object. Okay, you may now continue reading. Apple’s net profit margins (i.e. cash they get to keep) are the stuff of dreams for most CEOs, and it puts them in a completely different league as their competitors. The next two most profitable companies are oil companies, which, as we all know, have a contract with the devil to trick humans into buying his urine to power their go karts until the end of days. So, they clearly have an unfair advantage. Despite the numbers, Apple’s stock tanked by a whopping 10% after they reported those record earnings. Why? Well, it turns out that Apple calculates that particular quarter as a 13-week instead of 14-week quarter, so the numbers were (logically) lower than other quarters. Somehow, this freaked people out, and consumer confidence fell again. The absurd thing is that Apple always informs the public regarding the 13-week impact ahead of time, but it still gets drowned out by the loud screams of ignorance and panic. 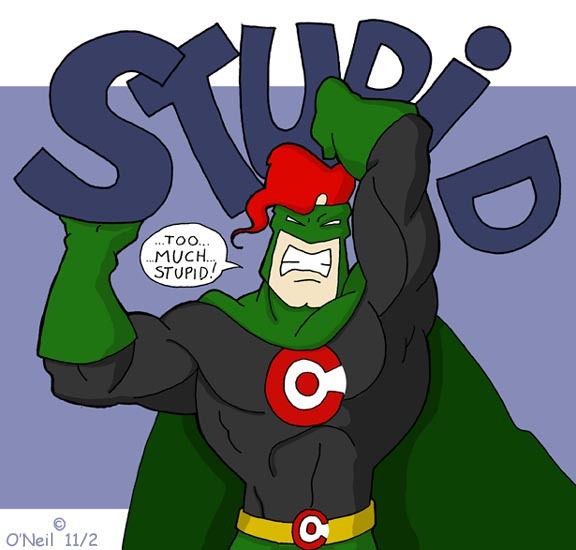 Apparently, even Captain Obvious is no match for the likes of The Human Idiot. 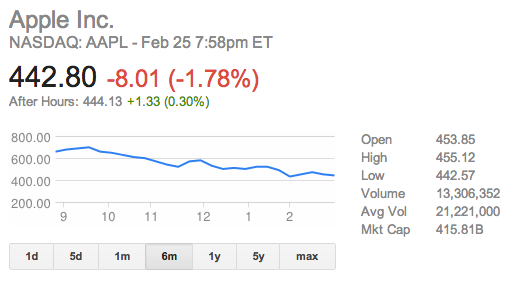 Somehow, Apple’s stock continues to dwindle despite record profits, sales and revenues. Overall, stock prices seem to reflect an increasingly contorted picture of the health of a company. Even expert traders for the most part find that their best results will match average performance of the market, assuming they are patient enough to wait for for them over the long term. So, the next time you’re thinking about investing in stocks for short-term returns, just try your money on the slot machines instead. They are both impossible to predict, yet delude you into thinking you’re mildly in control. Think doing your stock homework will change the outcome of your investment? It might — the same way that pulling the slot machine lever while holding your lucky Honey Boo Boo keychain might just get you a jackpot. P.S. Why in God’s name do you have a Honey Boo Boo keychain, anyway? What is wrong with you? Make the stock market just one of your investments. Instead of only investing in stocks, diversify the type of investments you make so that you have better odds of making money. Invest in real estate and in certificates of deposit in addition to stocks so that you’ll still make money if your stock investments fail. in it. 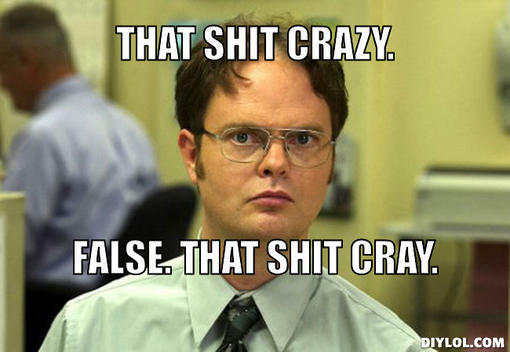 Supply and demand is how the stock market operates. The amount of shares of stocks is what makes up the supply. The demand is determined by the amount of shares that investors are interested in purchasing. is a person on the other side that sells the share.